San Jose gave up 2017 and 2018 second-round picks and forward Raffi Torres in the deal. 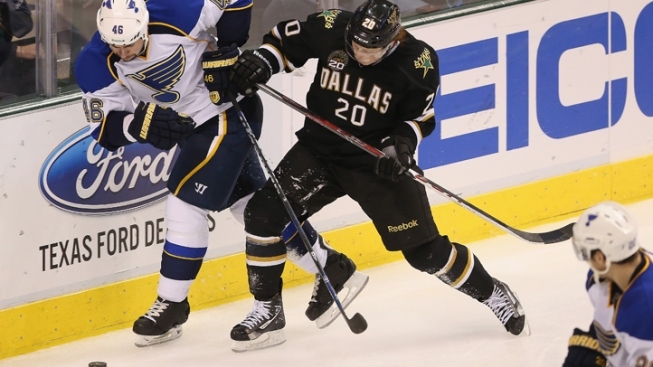 File image: Roman Polak #46 of the St. Louis Blues skates the puck against Cody Eakin #20 of the Dallas Stars at American Airlines Center in this 2013 photo. The San Jose Sharks acquired defenseman Roman Polak and forward Nick Spaling from the Toronto Maple Leafs on Monday to add veteran depth to help boost the team on a possible playoff run. The Sharks gave up 2017 and 2018 second-round picks and forward Raffi Torres in the deal they hope fills any holes before next week's trade deadline. After missing the playoffs for the first time since 2003 last season, San Jose entered Monday in third place in the Pacific Division and in striking distance of California rivals Los Angeles and Anaheim for the top spot. "We wanted to give this group the ability to compete and they deserve it. They have really worked hard," general manager Doug Wilson said. "We've put ourselves in a really good position and you make the determination on this team now with these added ingredients. It feels like they can compete. That's important in the room." Polak and Spaling both can become unrestricted free agents after the season but Wilson believes they add needed ingredients to his roster. Polak is a physical defenseman who has spent most of his career in the Western Conference. He had one goal and 12 assists in 55 games with Toronto this season but is a capable penalty killer and could replace rookie Dylan DeMelo on San Jose's third pair. "Roman, there's no question what his characteristics are," Toronto general manager Lou Lamoriello said. "He's a man. He's a player's player. He competes each and every night. He's somebody that you go into a foxhole at any given time. ... I just can't say enough about him." Spaling also has experience playing in the Western Conference, having spent his first five seasons in Nashville. He also played junior hockey for Sharks coach Peter DeBoer with the Kitchener Rangers and gives San Jose another option for its bottom two forward lines. Spaling has one goal and six assists in 35 games this season and has played extensively on the penalty kill. The Sharks hope Polak and Spaling will join the team in Colorado for a game Wednesday night. Wilson wanted to make upgrades without giving up a player in the lineup or one of the young players in the system that the team is counting on to help in the near future. He also did not want to give up a pick in this year's draft if possible after previously trading San Jose's first-rounder to Boston for goalie Martin Jones and third-rounder to Dallas in the deal that brought defenseman Brenden Dillon to the Sharks. Torres hasn't played this season because of suspension and injury and will be eligible for free agency this summer. Torres played just 12 regular-season and playoff games combined in his final three seasons with the Sharks. The Sharks needed to include his contract to make the deal work under the salary cap. "Raff is a good man," Wilson said. "He's been on a tough journey. He just needs more time to go get healthy and go on with his career. This was a necessary part of this deal to make it work cap wise and financially." Torres was suspended six playoff games in 2013 for a hit to the head of Los Angeles' Jarret Stoll and 41 games this season for an illegal hit to the head against Anaheim's Jakob Silfverberg in the preseason. Torres also missed significant time because of various knee injuries and had spent time this season in the AHL after his suspension ended last month. Torres will remain with the Sharks' AHL affiliate in San Jose even after the trade. The second-round picks are in keeping with the Maple Leafs' trend of stockpiling for the future. The Leafs had previously added draft picks this season by trading forward Shawn Matthias to Colorado and defenseman Dion Phaneuf to Ottawa.